At this time last year, most Cubs-related excitement flowed from the promise of the Cubs hitters looming on the horizon. We had already seen bits of the handiwork of Jorge Soler and Javier Baez during the 2014 season, and anticipation for the arrival of Kris Bryant (after, of course, a brief stay in Des Moines) was whetting our appetites for the 2015 season. This season, those hitters are already in the big-leagues, and waiting quietly in the background are a host of pitchers who could keep this team in contention even as we approach the next decade. And that isn’t a sign of a shift in philosophy, but rather the next step in what has been a larger plan. The Cubs, for the last half-decade, have preferred to draft pitching in volume, counting on the vagaries of attrition to cull the crop of young hurlers as they progress through the system. They feel that, at the top of the draft, where the talent is highest, the best bet is essentially always a position player. That’s led the Cubs away from top pitching talents like Brady Aiken and Mark Appel, and towards pitchers who take a little bit longer to work through the system. That’s led the top of the Cubs’ pitching ranks to appear thin in recent years, but it’s also meant that the Cubs have an incredibly deep bench of pitchers who are finally starting to crack the upper levels of the system. Just two pitchers were featured in last year’s Cubs top ten prospects list from Baseball Prospectus: Pierce Johnson at #7 and Carson Sands at #10. This year’s list from BP has yet to be released, but Baseball America has already released their top ten for the Cubs system, and the number of pitchers on that list has gone up to three—but three different pitchers than BP identified last year. And it’s not that Sands and Johnson have fallen out of favor, but that the list of pitchers to choose from for lists like these is growing. FanGraphs has three pitchers in their top ten for 2016, and there’s a new name in there as well. Everywhere you look, in fact, there’s recognition of the Cubs’ seriously talented crop of young pitchers. The Cubs organization has been developing this crop of pitchers at the same time as the offensive powerhouse we’re seeing on the field now, but just at a slower pace. Because of this, the next wave of prospects coming to the Cubs stands a very good chance to be loaded with pitchers. Let’s take a look then at what we might expect from a few of them. You’ve probably heard these names before, but if you haven’t, get ready: you’ll hear a lot more about them soon. The earliest to make an impact will likely be Carl Edwards, Jr., and we saw just a taste of what he might be able to provide on the mound in the majors at the very end of last season. PECOTA looks on him somewhat favorably for 2016 (he’s projected for 0.3 WARP—that’s hard for a pitcher with such low inning totals to do), but his role is probably still a bit unclear. As it stands now, he bodes well to be a reliever very capable of sliding into the 7th, 8th, or 9th innings pretty nicely, provided that he can keep his walk rate down. He won’t make it to the big leagues on Opening Day unless something dramatically changes at the back of the ‘pen, but he should feature at Wrigley at some point in 2016. After Edwards, one of the pitchers who I believe has the greatest chance at a 2016 appearance is Pierce Johnson. He was drafted out of Missouri State in 2012, and he spent last season in Double-A Tennessee, where he posted a 3.47 FIP in 95 innings thrown. Johnson also got work in with the Arizona Fall League this past year, where he might have struggled in some ways (6.10 FIP, jump in BB/9), but he also recorded almost a strikeout per nine innings higher than what he had done in Double-A, and BABIP may have gotten the best of him then, jumping to .333 in the fall league compared to .266 in Double-A. He’ll keep working at Triple-A to start the season, and could easily be a September callup if things break well. Just a level below Johnson last year at High-A Myrtle Beach was Duane Underwood, who could also be among the first to see time on the mound at Wrigley. In 73 1/3 innings last season, he showed the ability to keep runners off of the basepaths (1.04 WHIP) even though he’s not getting a ton of strikeouts (5.9 K/9, 16.7 percent strikeout rate). The biggest concern here might be whether or not he can stay healthy enough to handle a workload high enough to move him up through the system. As he proves that, he’ll stay part of a loaded Double-A rotation that’ll also probably include Jen-Ho Tseng—another name to know—in 2016. After Johnson and Underwood, there’s a host of potential impact talent taking the mound in the lower levels of the minor leagues. 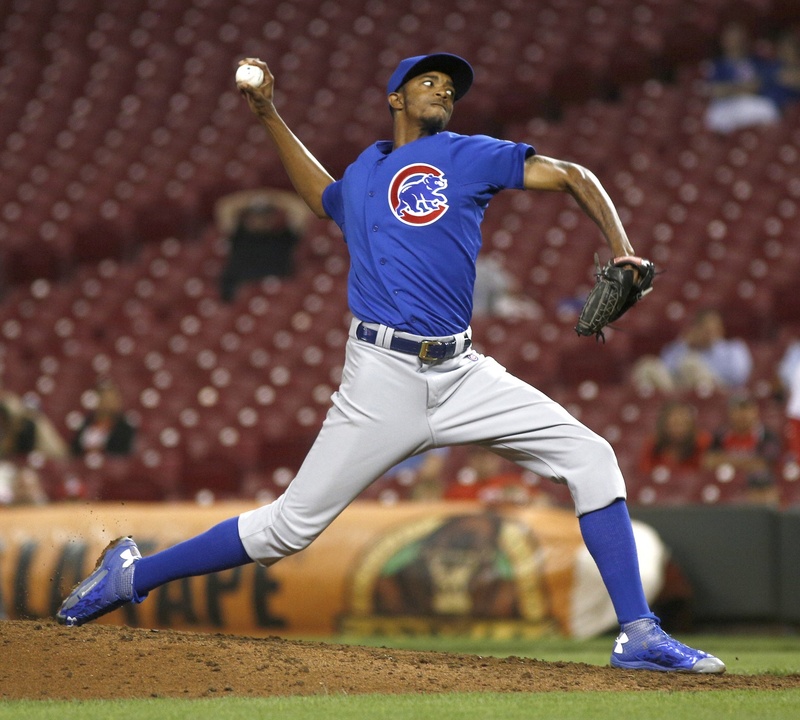 Many of them are still at the rookie ball and short season level, but there’s a host of them, and several, like Justin Steele, Oscar de la Cruz, and Adbert Alzolay give ample reason for optimism about the future of Cubs pitching. As has clearly been the design for several years now, I see these pitching talents converging on the Cubs roster at just about the same time as the young fleet of hitters is reaching its collective peak, allowing all elements of the plan to come together in the right balance. The Cubs of 2015 surprised a lot of us, heck, probably nearly all of us, and maybe this year’s team will just continue on this course. But even if they don’t, I suspect that this wave of pitching talent will be just what they need to push them over the cusp of what it takes to finally win a championship. Lead photo courtesy David Kohl—USA Today Sports. I just can’t understand why the various outlets, and maybe even the Cub FO, doesn’t value Edwards more. He has dwarfed what all our other prospects have done, despite they being at lower levels on top of it. If the Cubs wanna convert him to a RP, he also showed far better in the minors than anyone on the Cubs, including Grimm and Ramirez (who put up ERAs in the 4’s in the minors before their own conversions to standout RP at the MLB level).